Clockwise from top: red, black, teal green, pink (refer to picture at right for color), purple, sky blue, natural, green, light orange (discontinued) and orange. See a picture showing packaging and a size comparison with a soda can and quarter. The natural lucky rabbit foot key chains are all light brown. The dyed key chains come in assorted colors. You can specify the specific colors you want or we can send you assorted dyed made up of the colors listed below. We also have SYNTHETIC rabbit foot keychains. The rabbit feet are 2.5" to 3" long for both the natural and the dyed. The rabbit feet are attached by plastic caps to a gold colored chain. Please note that our minimum order is US$75.00. You can mix and match other items from our site, but the total before shipping must be US$75.00. Orders for quantities more than 24 must be by the dozen. No mixing and matching different colors for quantity pricing under 24. Call for special import pricing for more than 10,000 keychains at a time. The rabbit foot keychains come from rabbits that were rasied for the food industry. The rabbits were not killed just for the feet. 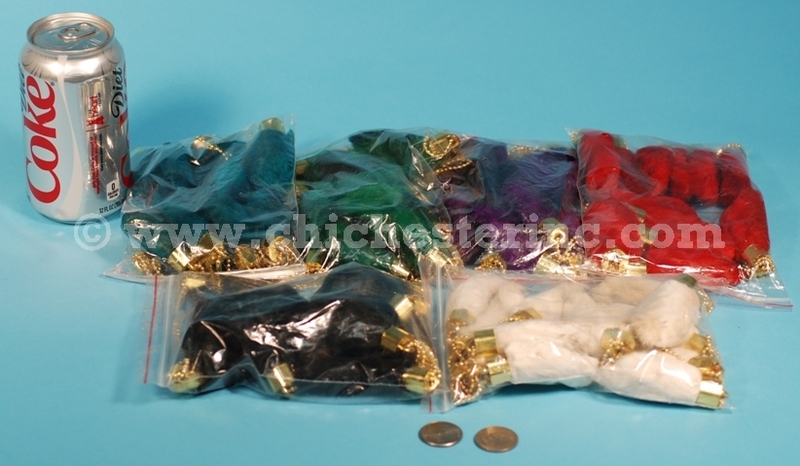 Shipping 12 rabbit foot keychains weighing 110 grams to Japan by Global EMI (3-5 days) was US$53.50 as of July 2011. Shipping 12 rabbit foot keychains weighing 110 grams to Japan by Global PMI (6-10 days) was US$48.40 as of July 2011. 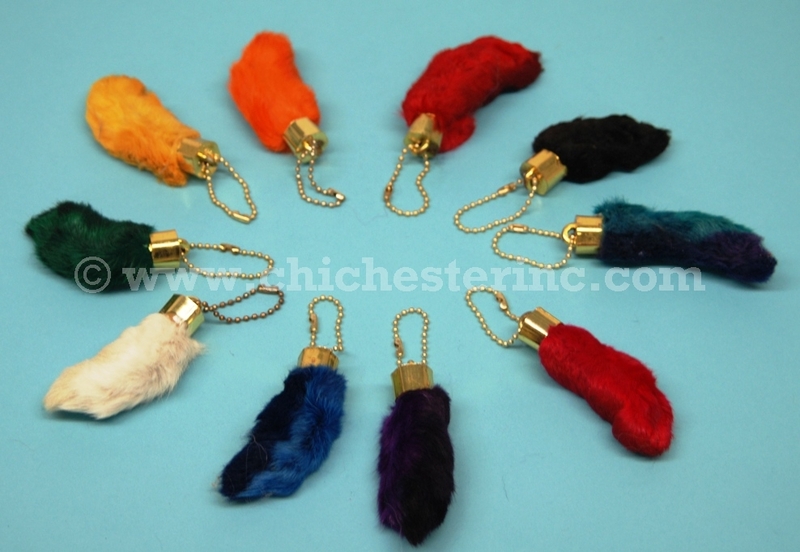 This video shows some of our real and synthetic rabbit foot keychains. 0:00 to 1:49 shows the real natural and dyed rabbit foot keychains. 1:50 to 3:26 shows the synthetic rabbit foot keychains.